Review: MOM! said Jake as his mom fell. Jakes life will never be the same in this book titled Jake. It is the only book in its series. It is written by Audrey Couloumbis. This book is exiting, heartbreaking and caring. The main character is Jake who is 10 years old. One day Jake and his mom are walking out of the grocery store, and when they get to the car, Jake's mom slips on ice and blacks out. She is taken to the hospital by ambulance where she finds out that she has a broken leg. 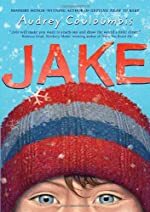 Jake finds a person who will take care of him while his mom is in the hospital, but he is mad that she might miss Christmas. His Granddad comes to help and gets Jakes mom a better doctor. But even so, she still is in the hospital and not in good shape. Will Jakes life ever be normal again? The ending is very good and has a special pizzazz. It doesn't make that much sense, but you get a good feeling about it. The farther you get into the book, the better it gets, and eventually you start to fall in love with it, and you want to read it over and over again. That's why I read it faster then you can say Jake. It's hard for Jake because his mother is hurt and he wants to help as much as he can, but there is not much he can do but hope. Jake is phenomenal and has great meaning to it. If you ever see this book in the bookstore or anywhere else, then definitely take a chance with it. Review written by Carson (6th grade student). We would like to thank Random House for providing a copy of Jake for this review. Have you read Jake? How would you rate it?